Magic is wrapped up in this whimsical dress! 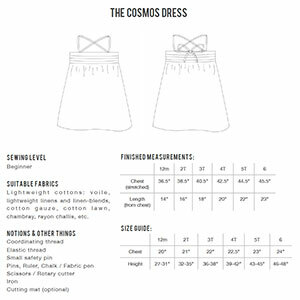 The Cosmos Dress is the epitome of comfort with its billowy bodice, shirred chest, and strappy back closure. A definite favorite and wardrobe staple, wear it alone or layer it with tees and leggings for cooler weather. 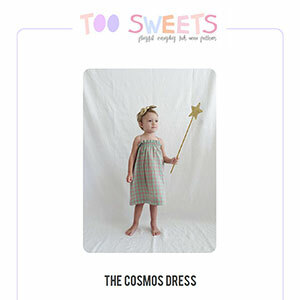 Designed to grow with your child, the Cosmos Dress will transition from dress to tunic to top beautifully. This pattern is available in sizes 12 months through 6 years. Suggested fabrics are light to mid weight wovens such as crepe de chine, rayon challis, peach skin or lawn or cotton jersey.